"Illegal in your own city." At least 40 Palestinian demonstrators, part of the #GreatReturnMarch, have recently been shot dead in Gaza by Israeli military snipers, including two clearly identified press members, with more than 5,000 others seriously injured by Israeli gun shots, tear gas attacks and other means. And the Trump administration has for the first time removed the descriptive term “occupied” in reference to the Palestinian territories in its annual 2018 State Department Report on Human Rights. In less than 10 days, Washington is scheduled to officially relocate its embassy in Israel from Tel Aviv to Jerusalem, symbolically and physically aligning itself with Israel’s decades-long campaign to claim the entire still-divided and partially occupied ancient city as its capital, in contravention of international law and long accepted diplomatic norms. No other major Western power recognizes Jerusalem as Israel’s capital, including every NATO member state. Israel has militarily occupied East Jerusalem since 1967, which the Palestine authorities also claim as their rightful capital. With all these accelerating developments and more in the Palestinian-Israeli conflict and the stalled Middle East peace process, I asked Nada Awad, advocacy officer at the Community Action Center (CAC) of Al-Quds University in occupied East Jerusalem’s Muslim Quarter in the Old City, what actions people in US and elsewhere can do to support Palestinians’ internationally recognized rights as an occupied population according to the Geneva Conventions and other applicable treaties and statutes. “For Jerusalem, for one thing, oppose (your) government decision to recognize Jerusalem as the capital of Israel. I don’t know if there is any movement in the US that opposes the administration’s decision. That is one thing,” remarked the knowledgeable spokeswoman in spacious modern CAC offices within what was once St. Julian’s Church built during a European Crusader campaign more than 800 years ago. “The other things are to raise awareness of the (ongoing occupation) and stop using the security argument all the time when we talk about Israel. 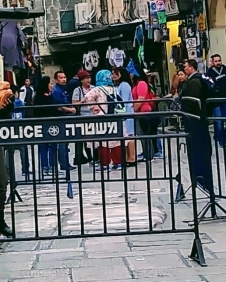 Pressed about conditions on the ground, Awad added the following from a physical location only yards away from Israeli military units controlling access to the golden domed Al Aqsa Mosque grounds, third holiest site in all Islam, as well as the main Old City checkpoint leading into the plaza surrounding the Western Wall, a site revered by countless numbers of the Jewish faith. “Those efforts to forcibly transfer Palestinians are increasing. Definitely. Definitely increasing. We are seeing it increasing with the laws in Jerusalem, but also the bedouins who are being forcibly transferred around Jerusalem. From Hebron being heavily colonized. (Like) in 1948, it’s the same idea. “I just talk about Jerusalem. We are very specific (at the CAC). It can be more generalized, but for me, the message I want to convey everytime I speak about the situation in Jerusalem is we have to stop seeing the occupation as, ah, a good provider of services, et cetera, et cetera. The occupation tries to show itself as a democracy that has everyone (in mind); in Jerusalem we have the three religions. And we have to stop looking at the occupation this way. We have to change glasses, and look at it the way it is. 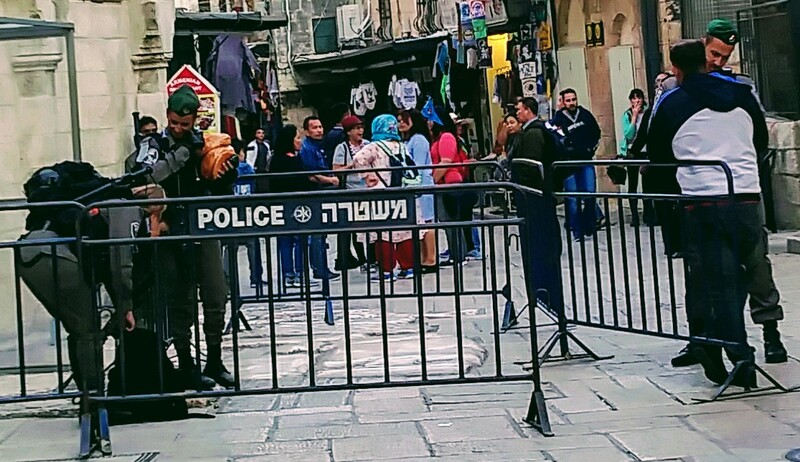 “Palestinians in Jerusalem live at risk of forcible transfer everyday. They cannot even stay in Jerusalem because you have targets by the Israeli government, and the (Jerusalem) municipality, that want to maintain their number. 30% Palestinians if they could, but they will visit it to 40%. The idea is the (Palestinian population) cannot exceed 40%. So we have to live with psychological warfare everyday in Jerusalem. “We have to (nonviolently) fight to be able to stay in our city we were born in. Where our grandparents were born in, and where our grand-grandparents were born in. 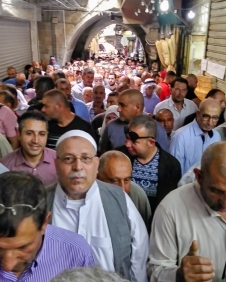 “If there is one message about Jerusalem, it’s forcible transfer,” Awad emphasized the point. “It’s not the only city where there is forcible transfer, but the fact that Americans through their administration has recognized the unity of the city, and denied that East Jerusalem is occupied in an illegal event.” In December 2017, the Trump administration announced its official recognition of Jerusalem as the capital of Israel, but delayed relocating its embassy from Tel Aviv until now. Awad sat at her desk computer dressed in casual clothes like any other millennial, with no veil or hijab, though at least one other female in the office was dressed in more traditional attire. Young European and American CAC workers and volunteers also were present. Asked if any countries are, in fact, effectively supporting Palestinians in these forcible transfer issues, Awad didn’t have much good news. 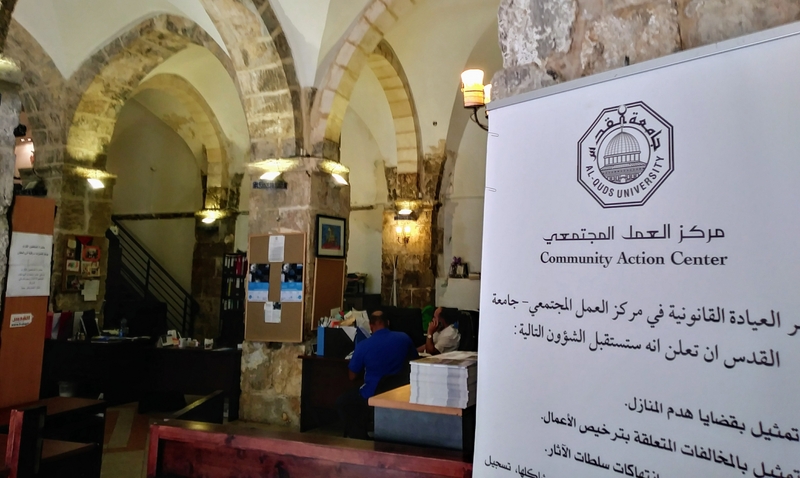 For the past two years, Awad has worked at the Community Action Center, operated by Al Quds University, which is one of several institutions providing pro bono legal aid to Palestinians in occupied East Jerusalem. 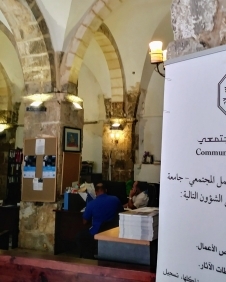 Other community services provided by the university in the Old City include library, cultural center, and an Arabic language school currently under renovation. “But this center specifically, the Cultural Action Center is providing legal aid because they live in a situation of occupation, and they have to fight the occupation on a daily basis, whether it’s, ah, because of residency revocation Israel is possibly transferring Palestinians from the city. And to fight this forcible transfer, we fight it legally, through the legal Israeli system, which is illegal. We have to in a way deal with the Israeli system since we realized Israel is, the laws, are becoming more and more discriminatory, more and more clearly violating international law, and more and more clearly calling for forcible transfer. We have been working on this aspect of international advocacy. Revoking Palestinian residency, redrawing the borders, not granting family reunification, not granting child registration, and demolishing homes in a systematic discriminatory manner are Israeli occupation policies all working together in order to change the overall demographic equation in occupied East Jerusalem, according to Awad. The determined Palestinian spokeswoman maintained that “we have not forgotten the right of return. People are still marching. People have not stopped since 1948. We have not stopped fighting. The fight is very difficult because, well, the power imbalance is very dear, but the fact that we are still fighting the occupation keeps me very optimistic in all ways. In all legitimate ways, we fight occupation, whether it’s through legal services, or through advocacy, or through (other means) like Boycott, Divest, Sanction. Awad went into great detail about each aspect of the CAC’s priority legal work — opposing redrawing borders, opposing refusal of family reunifications, opposing prohibitions on child registration, and opposing systematic discriminatory home demolitions — for East Jerusalem’s threatened Palestinian population. But she insisted on emphasizing the residency issue, “situations that are in place for Palestinians in Jerusalem,” in order to best understand the occupation. “Since 1967, all Palestinians — there’s a plan by the Israelis, the municipal plan, enacted in 1973 that wants to create and maintain an Israeli majority in the city. So in order to get there, a demographic balance, a demographic ratio that’s supposed to be 70/30. The overall ratio of the population must be maintained at 70% Jew and 30% Palestinian. They call us Arabs. And it apparently gets worse. “So this status has been more and more easily revocable since 1967,” Awad claims. “In 1995, the center of life policy was introduced meaning that a Palestinian who lives in the city, or in Palestine, the West Bank, would lose their residency because they cannot prove center of life. Before that, the Minister of Interior was invited to revoke residency ​only​ when a Palestinian would leave the country for 7 years or more, get a permanent residency abroad, or nationality abroad. So you see, it’s escalating. 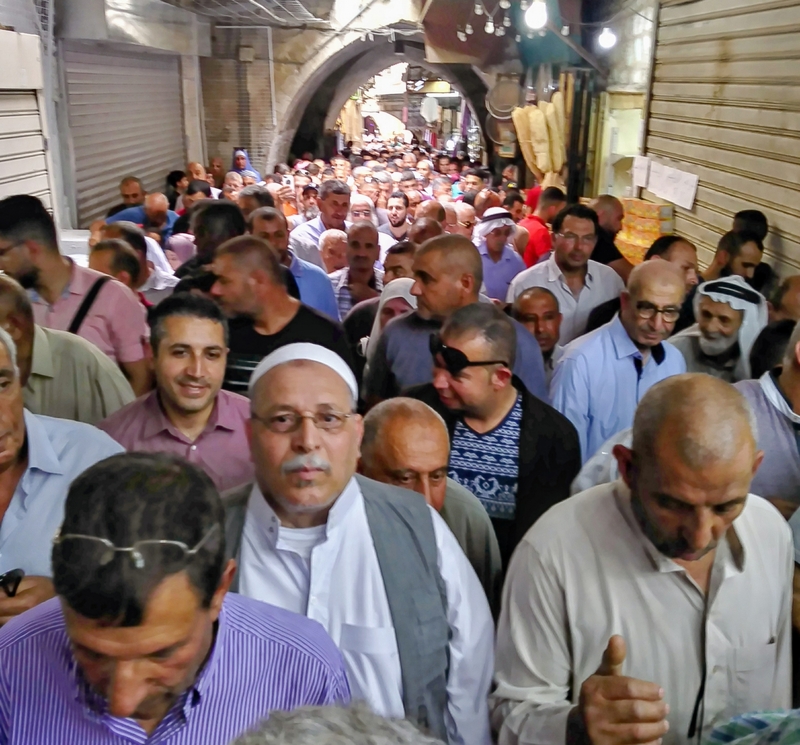 And the loss of legal residency for a growing number of Palestinians in Jerusalem leaves them wide open to exploitation by nearly everyone around them with an agenda. “You can receive a first permit, but it has to be renewed every year,” Awad noted. “Then you try and renew it, and they will tell you ‘no’. So you can find yourself living in Jerusalem without a permit. This person cannot support, cannot go out, visit their family who live outside Jerusalem. Well, you will try to work even for an Israeli company who will hire you for less. Of course, everyone without proper documentation is open for society to exploit them. Even for lawyers to exploit them. When they’re vulnerable, it can be an Israeli exploiting you, it can be a Palestinian, it can be your family. The CAC provides a referral system for people with mental health problems, chronic diseases based on stress, the need for psycho-social support, and other physical and emotional issues all connected to the ongoing Israeli occupation.